Retired Lieutenant Joe Leaphorn has seen just about everything in his long career. As the tribal police's investigation unfolds, he begins to suspect that the bombing may be linked to a cold case he handled years ago. As he, Bernadette, and Chee carefully pull away the layers behind the crime, they make a disturbing discovery: a meticulous and very patient killer with a long-simmering plan of revenge. 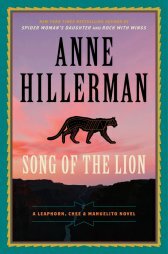 Click here for more information on Song of the Lion.